Although it's barely Autumn, Christmas has begun to make it's presence known. Already in Selfridges, a dedicated Christmas shop has opened, filled with shiny baubles and glittery ornaments sure to flake like dandruff all over everything one loves. Disregard that fluffy, amusing image for a moment and instead avert your attention to a more serious yet no less heartwarming thought. 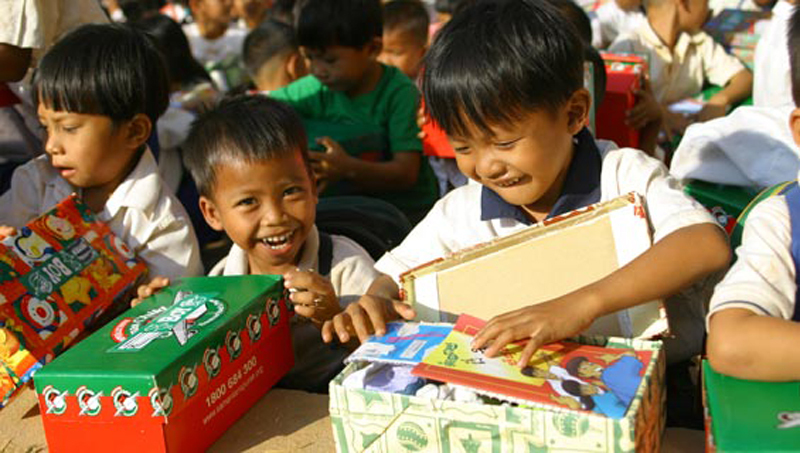 Every year, Operation Christmas Child sends a shoebox packed with presents to children in countries struck by war and living in poverty. Since 1990, children in more than 150 countries have experienced the joy of a Christmas gift, a luxury that those of us who live in first world countries often take for granted. Sobering thought, isn't it? Should your sister moan about receiving an iPad mini instead of a pony for Christmas, slap her in the face, take the iPad from her and then set the Operation Christmas Child website as her browser's home page to remind her of how much she has and what she can do for those who have so much less. 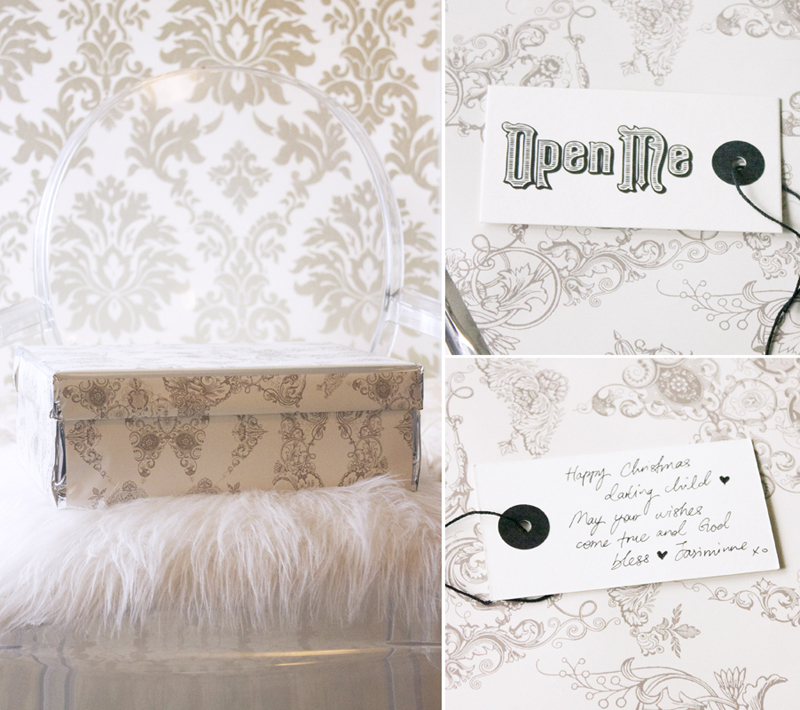 I cannot thank Catherine Lux of Lux Life blog enough for bringing this wonderful project to my attention. The premise is simple. One takes an old shoebox and wraps it in Christmas wrapping paper. One decides if the box is for a boy or girl, and of what age range. 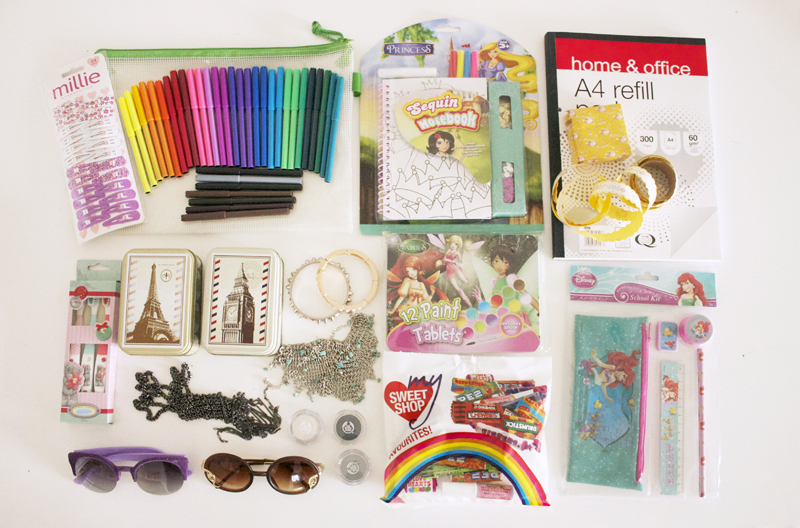 One then fills it with small presents like toys, sweets, educational items etc. One then wraps, packs, and drops the box of at the nearest Drop Off point where it will be processed and sent to their in-country partners who will deliver it to a child in need. The gifts don't even have to be bank-breaking expensive. One can go to a pound shop, drugstore, etc. and easily fill the box with a dozen presents for under £20. Set aside £3 for donation, to cover postage costs. I spent only about £20 for 14 gifts (although some were free, from fashion show goody bags). Shocking, it is, when I think about how people spend £20 on a cocktail that will literally turn into pee within an hour. It really is so humbling to think that the money one spends thoughtlessly can bring so much joy to someone else. Here's what I filled my box with. For a girl aged 10-14. I filled my box with art materials, sweets, and accessories for a girl aged 10-14 because I think everyone should have the means and chance to be creative, be stylish, and eat lots of candy on Christmas Day. If the girl who opens the box happens to dream of being an artist and my gifts give her that little push toward that goal wouldn't that be most wonderful!? That reminds me of the time I taught art to underprivileged children through StART Society, Malaysia. Another wonderful cause that I urge you to look into. Wrapping my box with Coolio who's being not very helpful at all. Coolio! Do you want to be in the box? You'd make a fine Christmas present, in fact you were my Christmas present and eversince you've been the gift that keeps on giving! 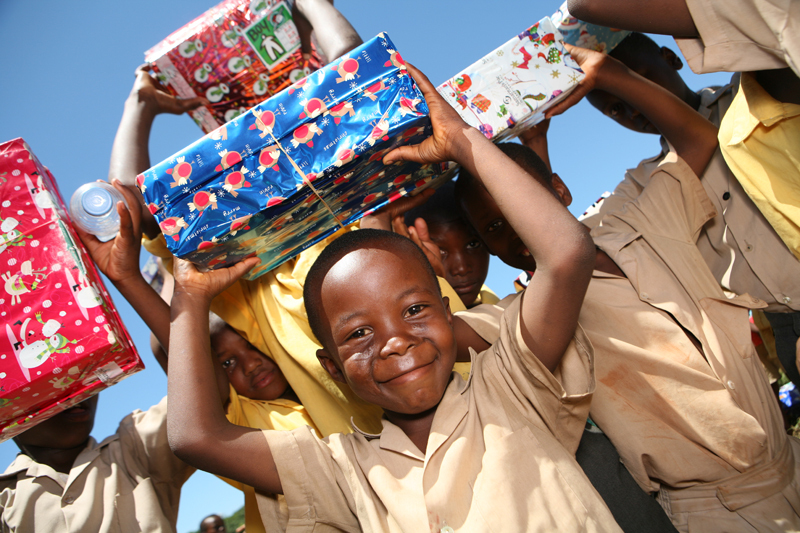 If you'd like to make a child happy this Christmas, go to the Operation Christmas Child website and get started. I warn you, the feel-good factor is high in this one. (Unless of course you're a heartless sociopath, and if so please stop reading my blog) Great karma and so much happiness to be had! Isn't that the REAL point of Christmas? The instructions are straightforward and to be found on OCC's website. You'll also find a list of suggestions for things to pack and things to not pack, here. Those who find themselves short of shoeboxes to pack with can come to my house and take one of mine order one from Samaritan's Purse. Shackled to your desk and can't spare the time to go shopping? You can create, online, a shoebox gift or order a pre-filled one on the Shoe Box World website. Customize the colour of the box, the gifts, anything...! Everytime you click on a gift to donate the website cheers you on with great big HURRAYS! It is the most uplifting thing, ever! Bloggers and social media enthusiasts, please spread the word with the hashtag #operationblogger. And if you make your own box, please do share! You can find me on Twitter and Instagram @jasiminne or leave me a comment linking to your posts. Yay!! 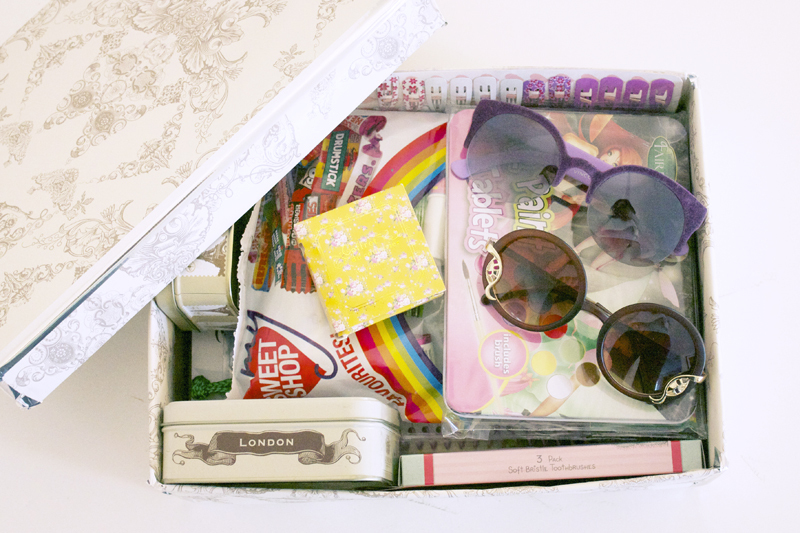 I LOVE your box, those sunnies are awesome! I'm still putting mine together (I'm slightly ashamed that you've already done yours despite me organizing #OperationBlogger ;) haha! ), but I can't wait to post about mine next week! Exciting! I commend you for your generosity (I wouldn't mind the box myself! ), there'll be a very happy girl opening that box! HOWEVER (sorry) - I do have to wonder if you know the full story of this 'charity'? I read a lot about them last year, and was pretty horrified that these boxes are aggressively used by an evangelical organisation as tools to try to convert Hindu and Muslim children to Christianity. There have been reports of children having to attend a 'Christian Rally' in order to receive these boxes. I love the whole shoebox idea, but I can't support OCC's heavy handed religious conversion tactics. I'll be giving my shoebox to the Rotary Club, who have no religious agenda.